3 medium-sized red bliss potatoes. (red bliss are pretty, buy any kind will do, really) washed, dried and sliced into 1/4 inch rounds. Drop in salted boiling water and boil around 7 minutes, till they’re soft but not falling apart. Drain and set aside. Peel strips of skin off. Cut the ends, and slice the rest into 1/4 inch rounds. Sprinkle with salt and let them sit about 1/2 an hour. Drop the eggplant slices into the beaten egg, and stir till they’re all lightly coated. Remove from the egg, and toss with the flour (mixed with black pepper), till they’re all lightly coated. Warm the olive oil in a wok or saucepan, and when it’s hot enough to sizzle a breadcrumb, drop the eggplant slices in in small batches. Fry till both sides are nicely brown, and it seems crispy, then remove with a slotted spoon and set on plates lined with paper towels to drain. 10 oz white mushrooms or baby bella. Clean. Slice into 1/4 inch rounds. Coat with the olive oil, balsamic and herbs. Mix with the shallots. Roast at 425 for about 20 minutes, till a warm brown color and just starting to blacken and get crispy. Warm the olive oil. Add the garlic and spices. Add the spinach, and sautée till just wilted. 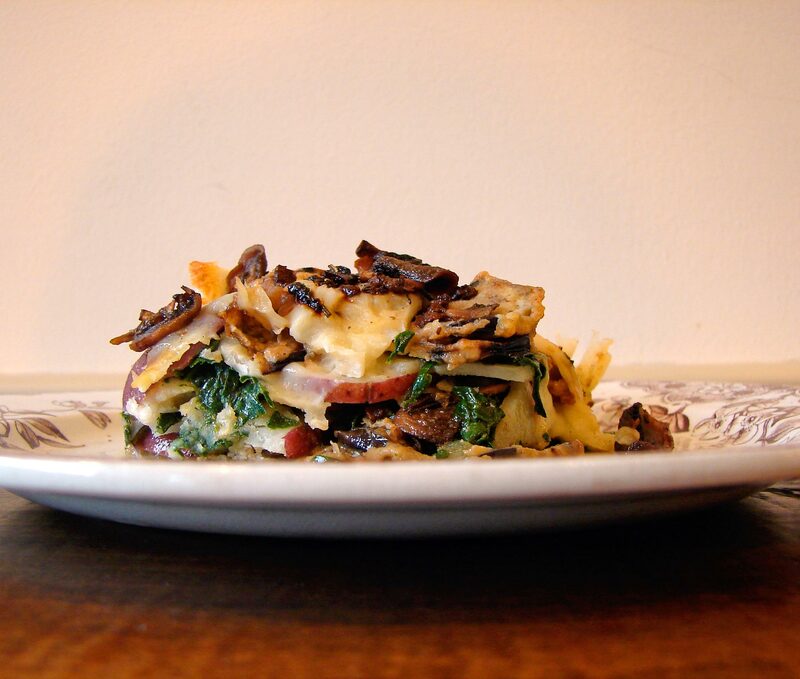 In a small casserole, tian, or gratin dish, spread a thin layer of 1/2 the eggplant. Top with a layer of 1/2 the mushrooms, then 1/2 the potatoes, then 1/2 the spinach, then cheese, then potatoes, then spinach then cheese, then eggplant, then mushrooms, and you can put scatter some cheese on top, too. The inside layers don’t have to actually be in any particular order, and you can do as many layers of cheese as you like. But try to end with eggplant and then mushrooms. Bake at 425 (preheated) for about 20 minutes to half an hour, till the cheese is melted and a little bubbly, and everything seems hot through. 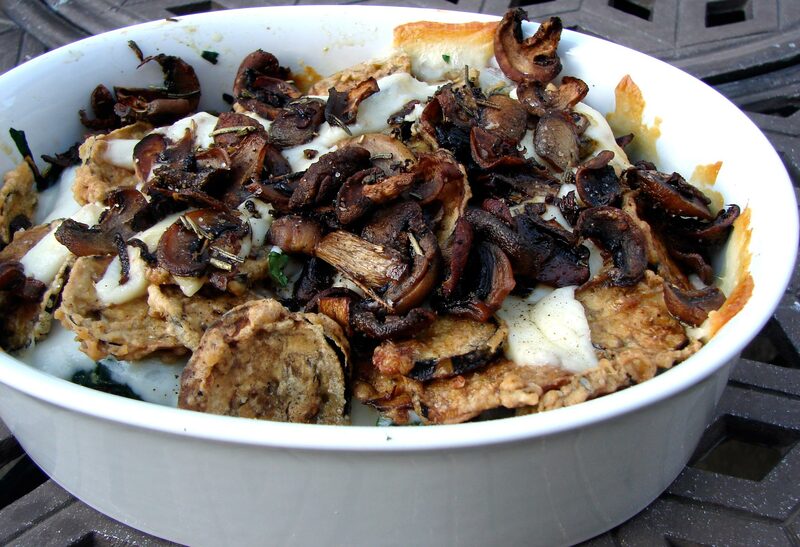 This entry was posted in mushrooms, potatoes, Uncategorized, vegetable side dish and tagged bake, casserole, fried eggplant, gratin, mozzarella, potatoes, roasted mushrooms, spinach by Claire. Bookmark the permalink. I was looking specifically for a recipe with eggplant, potatoes, and mushrooms — and your website popped up! Can’t wait to try it. Looks delicious. Thanks!! Hope it works out for you!